Walt Disney World has so many fabulous restaurants on property from your basic burgers and fries to a fine dining, ten-course feast. There are countless options for everyone. Proposing to your sweetheart can be nerve-wracking time, but with some help from Disney, the moment can be perfect. 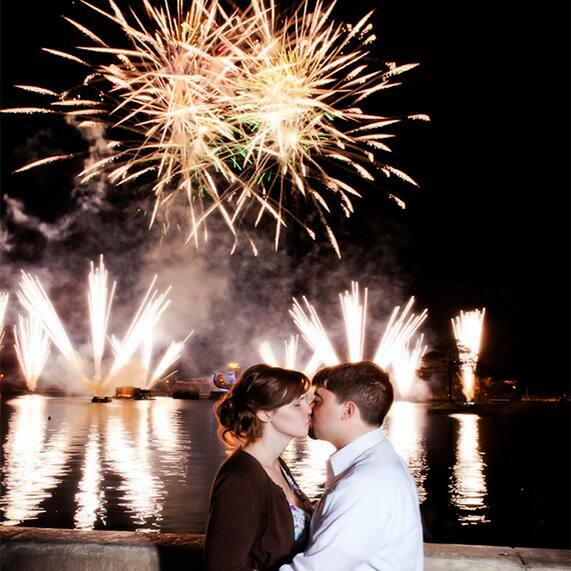 You can propose over a delicious, surprise dessert, or perhaps, with the fireworks going off above you. No matter what backdrop you are searching for, you will surely find it here. Looking for some place quiet and romantic? 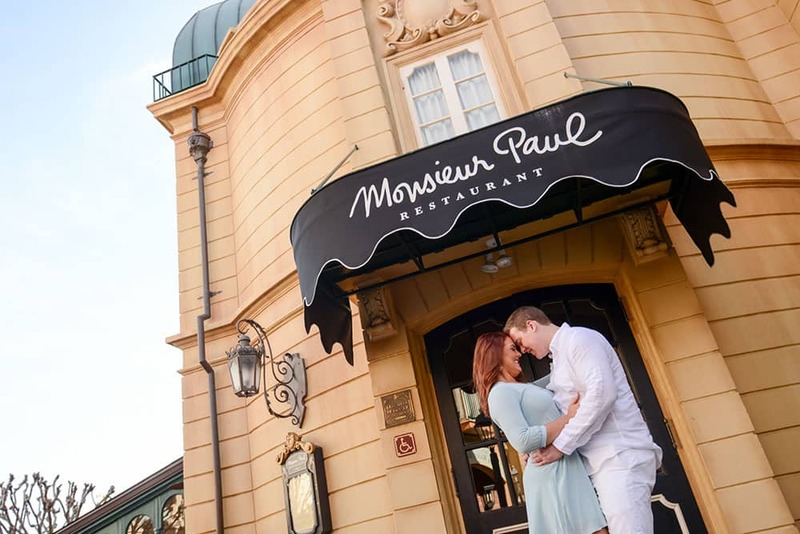 Monsieur Paul: A gourmet option in the France Pavilion in Epcot serving classic French cuisine. 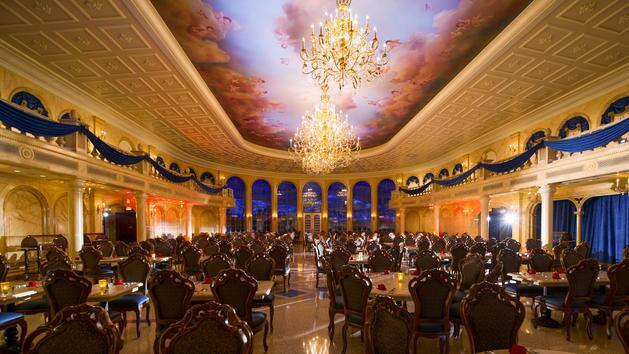 The dining room is elegant and smaller than most Disney restaurants. It is located on the second story, above the other French restaurant, Les Chefs de France. One of the great perks here, besides the upscale menu, is the prime view of Illuminations: Reflections of Earth right outside. Try to get a window seat and prepare to get down on one knee after a delectable meal in this intimate setting. 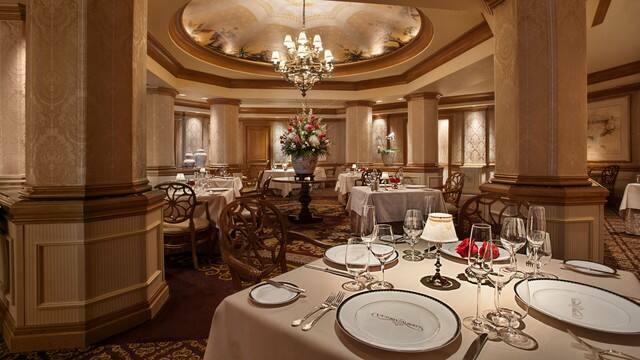 Victoria and Albert's: The cream of the crop for fine dining at Disney. This restaurant at Disney's Grand Floridian Resort & Spa takes you on an exquisite seven-course dinner experience, or you can even indulge in a 10-course spread paired with wine and spirits at the exclusive Chef's Table. As a recipient of AAA's highest accolade "“ The Five Diamond Award, and Forbes Travel Guide's Four Star rating, you can be assured that even without the proposal, this meal will be unforgettable. With only one seating per night, reservations can be extremely difficult to land, so once again, book as early as possible (up to 180 days prior to your visit). There is a strict dress code here, so be sure to look over the policy before attending. Amorette's Patisserie: This high-end pastry shop in Disney Springs will satisfy any sweet tooth. 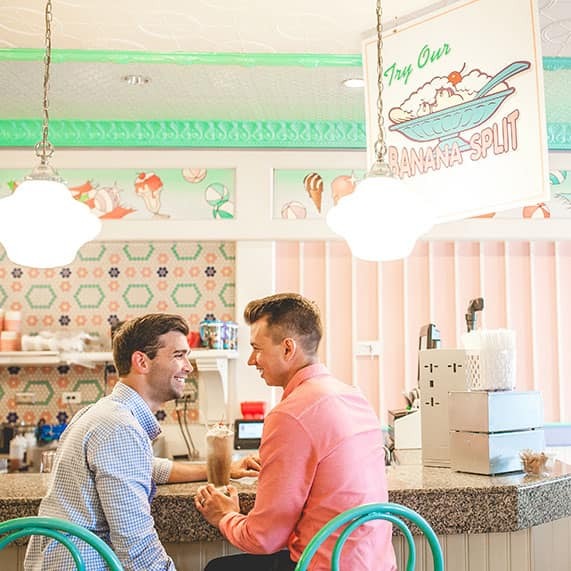 Their artisanal treats and signature cakes make for a great indulgence after a surprise proposal. While the environment might not be ideal to pop the question, any of these pastries or cakes can be taken to go. It might be the perfect way to pull off the classic ring-inside-dessert move. 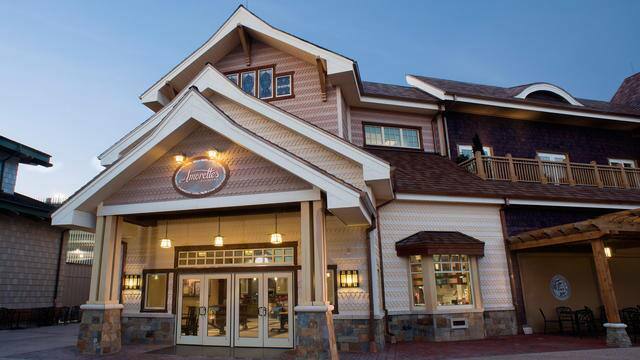 Beaches and Cream Soda Shop: An old school, nostalgic American diner at Disney's Beach Club resort. A terrific place to ask your significant other if they want to go steady with you"¦forever. With a full menu of decadent sundaes, milkshakes, and ice cream creations like the monstrous Kitchen Sink, this is a dessert paradise. 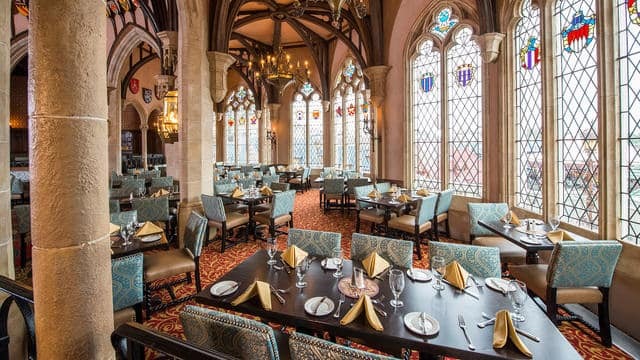 Be Our Guest Restaurant: Dine in Beast's enchanted castle in Disney's Magic Kingdom and experience the expansive and beautiful dining room. As you gaze across the table at your prince or princess, you will feel like you are in the movie itself as you sit under the massive chandeliers and domed ceiling. Enjoy French-inspired cuisine morning, noon, or night but know that dinner is the only table service occasion. Don't forget to try the Grey Stuff for dessert (it's delicious)! While the setting is picture perfect, it can be crowded, and since this is in Magic Kingdom, expect many small children and large families, which may disrupt your romantic proposal. Cinderella's Royal Table: A truly storybook setting inside Cinderella Castle inside Magic Kingdom. Enjoy a regal banquet of American fare with special visits from Disney Princesses. Large stained-glass windows surround the dining area along with medieval décor to immerse you in the extravagant environment. Give your romance story its own happily ever after with a proposal fit for royalty. 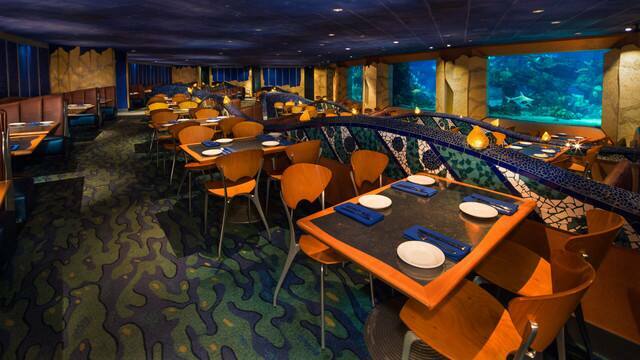 Coral Reef Restaurant: Marvel at the spectacular views of a living coral reef as thousands of sea creatures swim past your table. Located in Epcot, this seafood restaurant is an intimate and picturesque setting to ask for your partner's hand in marriage. You might even see scuba-diving Mickey through the window! 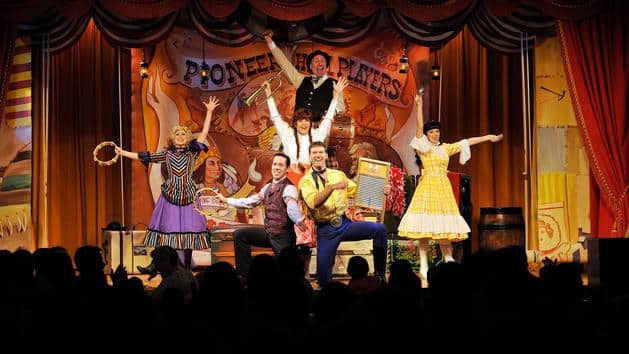 Hoop-Dee-Do Musical Revue: If you are interested in something a little different, perhaps this high-spirited, rousing Western dinner show will be just right. Enjoy this 2 hour "good ol' time" at Disney's Fort Wilderness Resort in Pioneer Hall. Included in the show is all-you-care-to-enjoy fried chicken, BBQ ribs, a whole selection of delicious home-style sides, and dessert. Plus if you are over 21, there is unlimited wine and beer. With the woodsy, rustic setting both outside and in, this could be the right spot to propose for any outdoorsy, fun-loving couple. 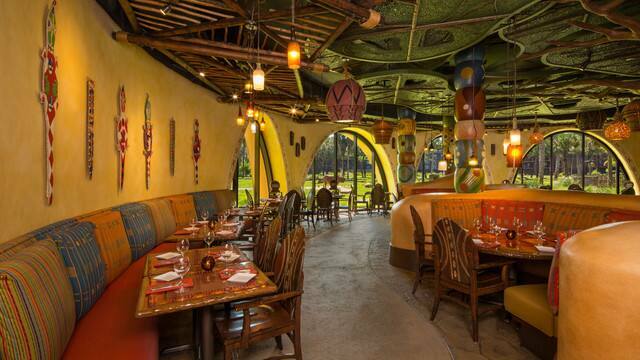 Sanaa: This exotic restaurant at Disney's Animal Kingdom Villas offers African cooking with Indian flavors. A great choice if you are searching for new and exciting flavors. Additionally, if seated by a window, you can view the wild animals that roam the 4 savannas of the resort. Proclaim your love for all the animal kingdom to see. Hoping for a fireworks finish? California Grill: A signature dining location overlooking Seven Seas Lagoon and Magic Kingdom from the 15th floor of Disney's Contemporary Resort. Delight in the flavors of Californian and Pacific Coast cuisine with your soon-to-be fiancé as you enjoy one of the best views of fireworks on property. 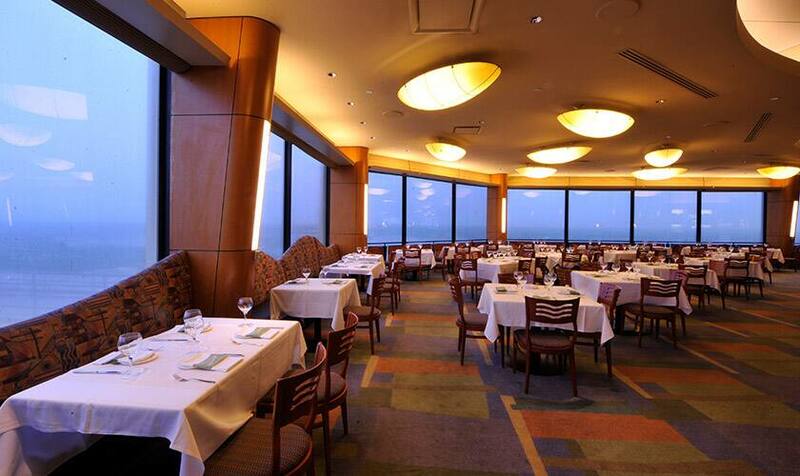 Because of the breathtaking view and floor to ceiling windows, it can be difficult to land a reservation here. However, there is also the California Grill Lounge, which offers the full restaurant menu, same magnificent view, and is first-come, first-served. Fireworks Dessert Party: Soak in the sensational fireworks at Magic Kingdom, Epcot, or Hollywood Studios with a scrumptious dessert party. Enjoy unforgettable views while tasting themed desserts and select drinks. No need to push your way through packed crowds in the hopes of finding a decent spot. With a dessert party, all you need to worry about is when you want to drop to one knee. The treats are taken care of, the setting is all ready, the view is perfect, and it's all up to you from there. You can make dining reservations online, through the My Disney Experience App, or by calling (407) WDW-DINE or (407) 939-3463. You will need a credit card number for booking, but you will not be charged unless you miss your reservation or cancel less than a day in advance. Visit the links for more information and full menus.